Raising mealworms is fairly easy since they are prolific breeders and are hardy insects. It is also fairly inexpensive and can save you quite a bit of money if you use a lot of worms every month. They rarely smell, are easy to care for, and don’t take much work. Breeding will take a while to get started, but once there are plenty of beetles laying eggs you will have worms for as long as you need. You should start with at least one hundred mealworms, but can begin with many more. Then, all you need is a container, substrate, and a source of food and water. The container should have a large surface area and smooth sides. The sides of the container only need to be a couple inches higher the substrate in order to prevent the worms from escaping. An aquarium, terrarium, plastic box, or Sterilite container will make an excellent home. The container will also need a screened lid to prevent other insects and creatures from getting in and to allow airflow. Good ventilation is needed to prevent the container from getting to warm and to prevent the buildup of humidity and mold growth. If you are using an aquarium, there are screened lids available. For a plastic box you can cut away most of the lid and attach some window screen. The substrate of the container will be the food. You can use wheat bran, oatmeal, cornmeal, wheat flour, Wheaties, Cheerios, ground up dry dog food, or a mixture of these dry foods. Fill the bottom of the container two or three inches deep with the food substrate. You will have to add more food regularly since mealworms are big eaters. Slices of potatoes, apples, carrots, lettuce, cabbage, or other fruits and vegetables can supply water to your worms. Potatoes are often preferred since they last a while and do not mold quickly. Do not use a bowl of water since mealworms will crawl in and drown. The ideal temperature for growing your colony is around 75 degrees F. A heat emitter may be necessary if you are in a cold climate. You will want to keep the container away from windows and direct sunlight to prevent it from becoming too warm. Light is not necessary. A normal day and night cycle of light will be fine. You colony of mealworms will reproduce more quickly with a higher humidity, but for most areas the natural humidity in the air will be sufficient. If you live in a dry climate, you can place a smooth glass or bowl of water into the container to raise the humidity. Make sure the water container is tall enough to prevent the worms from crawling in. 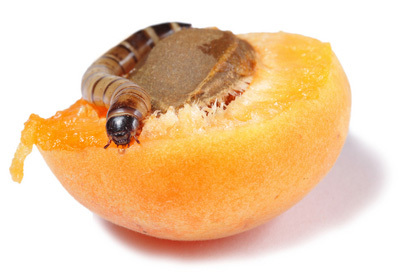 Any dead worms, pupae, or beetles should be removed from the container regularly. If the container begins to smell like ammonia or becomes moldy, it is time to clean the container. You will need to remove all of the mealworms, beetles, and pupae, discard the food and waste, and clean the container. Once clean, replace the food substrate and return the insects to the container. It is helpful to have a second container to aid in raising mealworms and keeping them odor free. After your colony is going strong, you can move any beetles to the second container where they will begin a new colony. By the time the second colony is established, the original container should have very few mealworms. You can move any remaining worms to the second container and the original container can then be cleaned and prepared to repeat the cycle.